Hyundai launches its first ever Quebec only ad campaign. Guess what? It uses a local celebrity spokesperson. I reacted with skepticism to Hyundai’s announcement last week that it had selected a local Quebec actor as its spokesperson. The “we-have-nothing-to-say-so-let’s-get-a-local-celebrity” strategy is unfortunately a common strategy in celebrity-obsessed Quebec. Yet after seeing the TV spot featuring Guillaume Lemay-Thivierge and the company press release explaining the fit between his personality and reputation for extreme sports, there might actually be a credible fit. needs that, like Guillaume, they've become very difficult to impress. exceptional talent, as do his many awards and nominations. Let’s see now if Quebeckers think this wakeboarding actor is like a fish out of water at the wheel of a Hyundai. Kelsey’s Neighbourhood Bar & Grill leaves Quebec’s neighbourhoods. Josée Béliveau, a spokesperson from Edelman Public Relations explained the decision in an article published in La Presse (March 12, 2008 LaPresseAffaires.com): “Let’s just say that the concept offered by the chain has not appealed to Quebeckers”. I am not privy to Kelsey’s national strategies and how (or if) they were adapted for the Quebec market but “pub-style restaurants” do just fine in Quebec. Perhaps Dave Minnett, president of Kelsey’s, points to the real issue: “The competition is different in Quebec.” (The Gazette, March 13, 2008). Quebeckers seek familiarity and a sense of place in the restaurants they patronize. And St-Hubert BBQ and its pub-style St-Hub Resto-Bar are a tough act to follow. Bilingual francophones in Quebec “get” English ads. According to Statistics Canada, there are 3 million bilingual francophones living in Quebec. That’s 41% of the population. A 1996 study conducted by research firm CROP for Publicité MBS shed some light on the effectiveness of English-language television advertising among bilingual francophones. 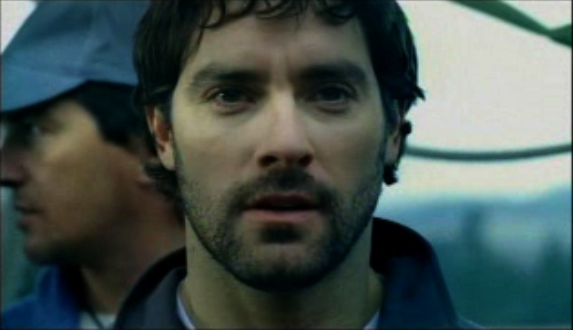 A series of eight 30 sec local and international TV spots were shown to 92 bilingual francophones and 40 anglophones. 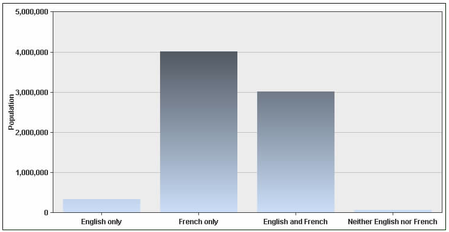 Comprehension rates were almost identical for both francophones and anglophones. Importantly, appreciation rates were similar. And it appears that comprehension rates weren’t affected by whether the spots used a predominantly visual approach or the spoken word. But before you shift your media weight to English networks in Quebec, keep in mind that the survey sample consisted of francophones who were conversant in English and who devoted a certain percentage of their TV viewing time to English programming. He’s right. The 3 million bilingual francophones are defined as having “knowledge of the official languages”. That number drops to 52,325 Quebec men and women when the criteria is French and English as the “languages spoken at home most often” and 43,335 when the criteria is English and French as “mother tongue”. What we know then is that the number of bilingual francophones that “get” English ads falls somewhere between 3 million and 40 thousand. Until someone provides more bulletproof data on this, I’d stick with French TV to reach French-speaking Quebeckers, bilingual or not. More than 80 of the complaints filed specifically targeted breweries. The rest were filed against bars, the SAQ or they did not target a specific message or promotion. While the voluntary code and the complaints mechanism via Educ’alcool’s website can play a significant role in furthering Educ’alcool’s mission of “improving Quebecers’ relationship to alcohol and drinking”, it can only go so far since the brewers have refused to adopt the industry’s code of ethics. 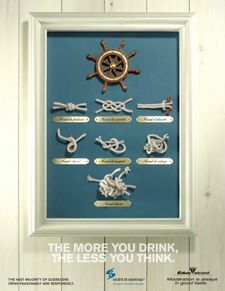 Only distillers, wine and cider producers, promotional agents, the Societe des alcohols du Quebec, restaurant associations and chains and the owners of bars, taverns and brasseries have adopted the code. Desjardins. It’s not a bank. Actually, it’s more than a bank. What is it, really? 2006 brought a shift in direction. Desjardins is now “More than a bank”. According to a piece in Quebec’s Le Devoir newspaper published on September 8, 2006, the “This is not a bank” theme sent the wrong signal to immigrants who, unaware of Desjardins’ history, sought “real” banks. What might look like a not so unusual course correction when branding fails to take into account all stakeholders actually points to a much more significant struggle inside Desjardins. And this struggle is now most evident during the election of its new CEO currently underway. Konrad Yakabuski summed it up best in a Globe & Mail article: "The election of a new CEO by 256 regional leaders and local caisse populaire managers is shaping up to be an epic battle between those who want Desjardins to stick to its knitting and those who believe the 5.8-million-member co-op is doomed unless it pursues its aggressive push to gain critical mass and credibility on Bay Street." 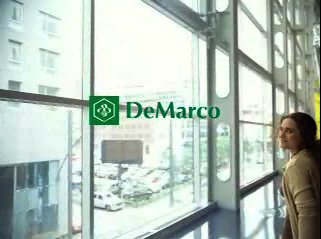 Is Desjardins becoming a "bank" and losing its values as a "movement"? Read Konrad Yakabuski's article "Get ready for a culture clash at Desjardins"
Building successful brands requires relevant differentiation. For national, North American or global brands competing in Quebec, this often requires that they be sensitive to the different attitudes and consumption behaviours of Quebec consumers. While there are many similarities between Quebec and the rest of Canada, leveraging these differences or at least adapting marketing approaches to reflect these differences can often be a competitive advantage. This presentation will review Headspace Marketing’s proprietary model of the various “Filters” and “Influencers” that impact Quebecers’ brand decision-making for products, services, ideas, causes and even people. The model was developed based on quantitative data from various sources including our firm’s own survey tool – the Headspace Monitor. 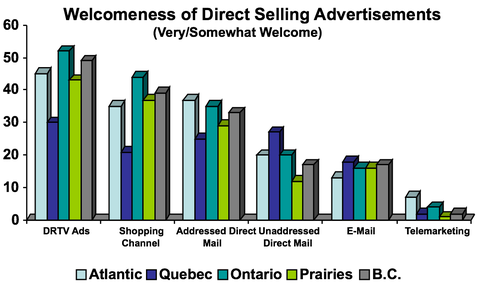 It provides an actionable tool to ensure brands capitalize on what resonates most with Quebecers. Each Filter and Influencer will be discussed and illustrated with examples. 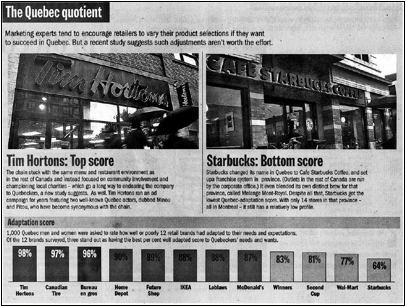 Tim Hortons resonates more with Quebeckers than Starbucks, while Canadian Tire is a hit in that province and Wal-Mart comes up wanting. A new study suggests that retailers based outside the province that want to get the nod from Quebeckers don't actually have to do anything different with their products or operations. Instead, they must come up with a spin that makes a connection with residents of la belle province, the study indicates. The findings even surprised author Eric Blais, whose Headspace Marketing Inc. firm in Toronto commissioned the study and produced the report, which will be issued soon. "There doesn't seem to be a need to fundamentally adjust your offerings to Quebeckers," Mr. Blais said in an interview. "But there is a need to present it in a manner that speaks to Quebeckers."